People collect water from a spring in the Newlands suburb as fears over the city's water crisis grow in Cape Town, South Africa, Jan. 25, 2018. African cities need to better plan and invest in water infrastructure, global accounting firm Deloitte said on Tuesday, as Cape Town counts down to dry taps due to severe drought. Officials predict taps in the South African city will run out of water on May 11, in a crisis that has brought to the fore the effects of climate change across the world. “Cape Town is not going to be the only city on this continent that’s going to suffer significant water shortage,” Jean-Pierre Labuschagne, an infrastructure expert with Deloitte, said at the launch of its Africa Construction Trends report. Cape Town authorities have imposed water restrictions that could hurt agricultural and industrial output, and have begun to affect tourism. Labuschagne said high levels of rural to urban migration had made it hard for many cities in Africa to plan well and expand infrastructure fast enough to accommodate increased numbers of people, most of whom ended up living in informal settlements. 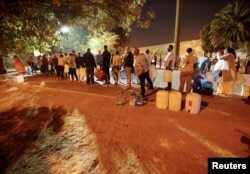 In Cape Town, South Africa, Jan. 25 2018, people wait their turn to take water from a spring in the Newlands suburb as fears over the city's water crisis grow. In addition, cities like Kenya’s Nairobi and Ghana’s Accra have suffered recurrent water shortages for years as reservoirs fall to critical levels in the dry season. Water shortages in these cities threaten the lives of million in places like Kibera in Nairobi — one of Africa’s largest slums — where an outbreak of sanitary diseases such as cholera and typhoid could be catastrophic. The Nairobi City Water and Sewerage Company said last month that Kenya’s capital could face water shortages by April if the country’s main rainy season, from March to May, fails. It started rationing domestic supplies in January as the Ndakaini Dam, the main reservoir for Nairobi, some 80 kilometres (50 miles) north of the capital, was half empty. The Ghana Water Company announced last month that it would ration water in the capital, Accra, and other parts of the country due to insufficient rain and pollution of water bodies. Building another dam was just half of the solution, said Labuschagne. “Making people understand the value of water is the other half,” he said.